Had she been born in different generation, she would probably be on the list of Al..
Had she been born in different generation, she would probably be on the list of Alfred Hitchcock’s fatal, classy blondes. 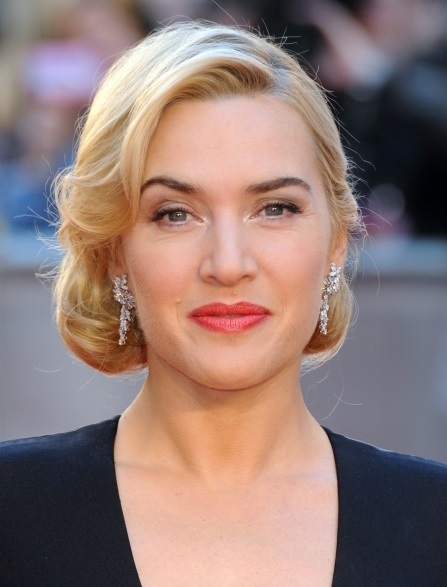 Kate Winslet definitely has that Hollywood golden era vibe, grace and elegance, so this vintage look is pulling the best out of her appearance, which is very important when wearing black as this is directing the whole attention to the face. Her medium length blond hair is deep side parted and her bangs are slightly curled at the ends so they could blend naturally into queue curl at the nape. A hairstyle worth considering when walking down the altar because it perfectly fits with a classic wedding dress.